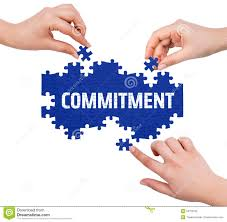 The word 'Commitment' has been variously described as "the trait of sincerity and focused purpose ". it is also said to be allegiance, loyalty, or dedication . it is a pledge, a promise or agreement to do something in the future for, and with the one we are committed to it is an undertaking to be dedicated or devoted to something. in other words, commitment says we are in it together- come rain, come sunshine. it says if we float, we float together, and if we sink (God forbid), we sink together. finally, commitment also means to be bound emotionally and intellectually to a course of specific action, or to another person(s). God is also committed to His word. whatever He has promised in His Word- the Holy BIBLE- He is committed to honoring at all costs (Num 23: 19; Heb 6: 18; Psalm 119: 89; Isa 40: 7-8). that is why He, the Almighty God demands commitment from all and every of his children and from all His workers. the primary ingredients of commitment are knowledge and intimacy. as a man, you cannot love, stake your life and resources, or be committed to who and what you are ignorant of. hence the need for knowledge and intimacy as well as understanding of what and who to be committed to. Still talking about knowledge and intimacy, both are not always positive or very pleasant! when you move closer to some people, you may hear or see some things that may put you off. it is often said that familiarity breeds contempt! Ordinarily and truly, closeness or intimacy may bring out some facts that can tend to reduce the level of respect you accord some people around you.